November 2013: We have to admit we thought we'd heard and seen it all ... that is, until we met Sawyer. 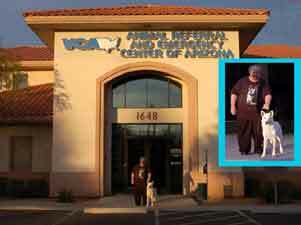 He had come into the Maricopa County Westside Shelter over Thanksgiving as a stray and put into the "S" wing, which is the section devoted to bite dogs, injured dogs and dogs which otherwise need to be held (for court cases, quarantines, etc.) but which were never going to be seen by the public and/or given a chance at adoption. 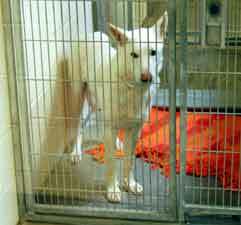 Even if Sawyer's owner had been looking for him (which we doubt), he would not have had access to the kennel area where Sawyer was being held. Shelter personnel "diagnosed" Sawyer as possibly having been struck by a car and recommended xrays, but their ultimate solution when his 3-day stray hold was up was to put him on the e-list to be destroyed. With no hope in sight, we received an email from a shelter friend telling us about Sawyer's plight and asking if we could help. 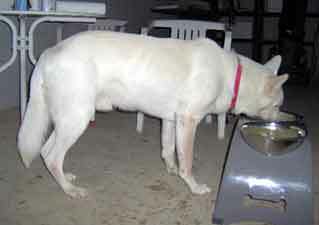 We were simply told that Sawyer was having trouble eating, was very thin and needed our help. 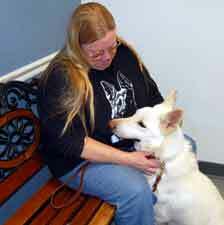 We waited out the Thanksgiving holiday and went to the shelter to meet and evaluate Sawyer on Monday, December 2nd. What we found was a very sweet boy, maybe 2 years old. We ran our hands over him, including his head and jaw, and did not feel that Sawyer was experiencing any pain or discomfort as he allowed us to handle and examine him, but something obviously wasn't right. 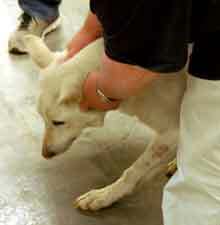 And so we made the decision to take this friendly boy and find out what was wrong and if we could help him. With his tail wagging the entire time, how could we say no to him? ...and leaves via the front door! 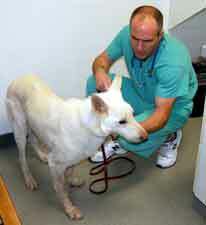 UPDATE 12/3: Sawyer saw our vet today and his findings stunned us. Sawyer had, indeed, suffered some kind of an injury or disfigurement to his lower jaw -- but it was not a new injury, but one that had "healed" (if it was an injury) in such a way that Sawyer is unable to open his mouth much more than an inch!!! If this is truly an injury, Sawyer had to have been in considerable pain for quite some time; how could no one have noticed? 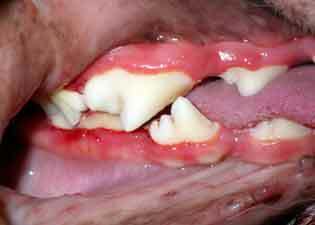 Jaw injuries are excruciatingly painful. How could he have managed to eat enough to keep himself alive without a fully functioning lower jaw? We were mystified. We credit Sawyer's spirit and will to live for the fact that he is alive today and still the happiest boy. 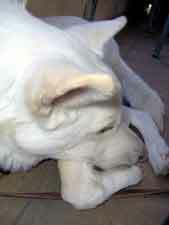 Our vet has referred us to a specialist to see if Sawyer's jaw can be adjusted to enable him to open it more fully. Our concern is not so much for his ability to eat (since obviously he has managed to eat enough to keep himself alive for quite some time), but in his ability to open his mouth fully to pant, once the hot weather returns. In the spirit of the holiday season, we are willing to go the extra mile to see if there is anything that we can do for Sawyer.Unfortunately, that extra mile is going to be expensive. Sawyer could sure use your help. Please check back as we make the appointment with the specialist to see if anything can be done for Sawyer. If not, this is by no means a death sentence as, obviously, Sawyer has learned to live with his "disability." It will simply take an adopter who is willing to go the distance with Sawyer. 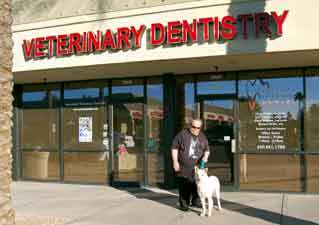 UPDATE 12/4: Sawyer has an appointment to see a specialist, Dr. Mark Soderstrom, at Sonora Veterinary Specialists, tomorrow morning. Hopefully he will have some good news for us. In the meantime, Sawyer is eating canned food and simply loving life. 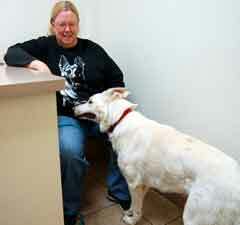 UPDATE 12/5: Sawyer checked in to Sonora Veterinary Specialists this morning for his initial exam. Needless to say, it's been a very worrisome few days, not knowing what to expect and fearing the worst. After examination, Dr. S suggested we run some bloodwork first before going any further ... what he suspects is NOT a devastating injury, but either a congenital jaw malformation (unlikely given that Sawyer lived through his puppyhood), cancer (also very unlikely, in Dr. S's opinion), or the dreaded valley fever, which commonly can settle in the jaw and wreck havoc. It's difficult to imagine that a positive valley fever test would be "the good news," but in Sawyer's case, it will be. Cancer is a death sentence, as just to confirm a diagnosis is well beyond the financial capabilities of our small rescue. Valley fever, although expensive, is treatable, and if that is Sawyer's confirmed diagnosis, Dr. S predicts a positive outcome for this sweet boy. We are praying he is right. The bloodwork results will be back in about 2 days. In the meantime, we will be holding our breaths and searching for the least expensive supplier of valley fever medications. UPDATE 12/10: We received the bloodwork results back from the vet (finally) today, and the news is not good. While Sawyer is registering a titer for Valley Fever, it is only a 1-8, which is an exposure, not the presence of the actual disease. We were hoping to find a very high titer, which is not the case. The vet will be treating him for 30 days just as a precaution, but this pretty much rules out Valley Fever as the cause of Sawyer's problems. 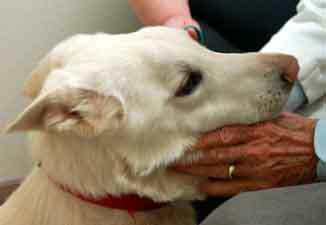 The vet is recommending an expensive ($1,000) bone biopsy to see what is growing in Sawyer's jawbone. That doesn't even include treatment for whatever is found. We have 30 days (while Sawyer is being treated for his Valley Fever exposure) in which to raise the money for the biopsy, or Sawyer's future is looking pretty grim. Sawyer could sure use your help. 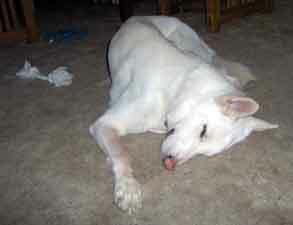 We have Sawyer's valley fever meds ordered, and he will be starting on them as soon as they arrive. In the meantime, he's being pampered and well fed by his foster mom and is completely unaware of the gravity of his current situation. Aren't dogs wonderful? UPDATE 12/20: Sawyer continues to do well. He's eating 2 puree'd meals a day and gaining weight slowly. One day this past week, he picked up a rope toy in the yard and ran around with it. We didn't even know he could do that!! UPDATE 12/21: Thanks to our wonderful supporters, we have raised the money for Sawyer's bone biopsy!! We can't thank you enough for stepping up for this sweet boy. We will be calling the vet on Monday to see when the procedure can be scheduled. It may only be the beginning of our ride with Sawyer, but we're determined to see it through -- he's so worth it. UPDATE 12/27: After a brief consultation with our rescue partner, we have decided that Sawyer's interests are not best served by a bone biopsy as the next step in the diagnosis of his problem(s). What about an x-ray? Why wouldn't that be done first prior to an expensive bone biopsy, we wondered? Our own vet suggested an x-ray, but hesitated to take one as he felt whatever was found would be beyond his field of expertise. Our calls to Dr. S have gone unanswered, and so we have decided to follow what we believe to be the logical path to diagnosis and make an appointment with a dental and jaw expert who, we believe, is a better choice for Sawyer's plan of treatment. In the meantime, Sawyer is being spoiled and well fed by his foster mom, and he is simply loving life. UPDATE 12/29: Our rescue partner, Steff, recommended we take Sawyer to Southwest Veterinary Surgical Services for diagnostics (xrays and possible surgery). Coincidentally, a prior adopter and member of Sawyer's Support Team, Kristie, recommended Dr. Curt Coffman -- who we found out in our research now works with Southwest! Trying to move forward with diagnosing and solving Sawyer's problem, we have made an appointment for a consultation on Friday, January 3rd. 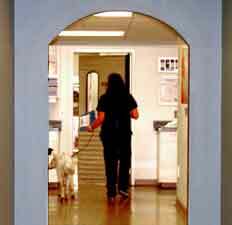 Hopefully, after that visit, we will have a clear path for Sawyer's rehabilitation. 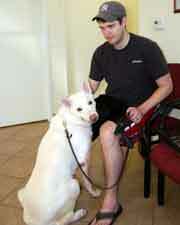 UPDATE 1/03: Sawyer saw Dr. Coffman and Dr. Vissar at Arizona Veterinary Dental Specialists this morning. He was thoroughly examined by both doctors (who fell in love with him), and was found to have gained 4 pounds since his initial vet visit in early December. After the consultation, there were several possibilities that could be causing Sawyer's problems, but the doctors were not comfortable enough to even make a guess at a definitive diagnosis at this point. Once again Sawyer was asked to "donate" some blood for a more comprehensive work-up, and a CT scan was scheduled for Tuesday morning. 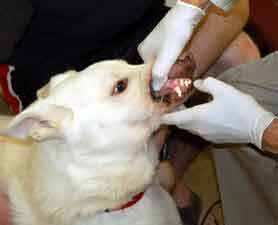 Xrays could not be taken simply because Sawyer cannot open his mouth, which is required for xray sedation. Needless to say, we just wiped out the $1,000 that we raised for Sawyer's bone biopsy (which both Dr. Coffman and Dr. Vissar felt was not called for), and we are back again, asking for your help for Sawyer. UPDATE 1/7 Early A.M.: Sawyer checks in for his CT scan. Bye, Sawyer. Our fingers are crossed for you! UPDATE 1/7 P.M.: We met with Dr. Keith after Sawyer's 3-D CT scan and multiple xrays and we have a "working diagnosis" of Craniomandibular Osteopathy and/or Nutritional Hyperparathyroidism. 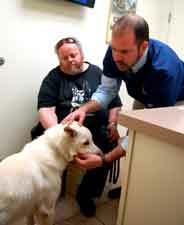 Dr. Keith was puzzled because dogs with CO normally show symptoms of the disease in the long bones of the body, accompanied by pain and fever; Sawyer has no such symptoms (as verified in the xrays), leading to a suspicion that the disease has reached its peak and will not progress any further (and may even receed). It could also be a combination of the two diseases, if Sawyer received extremely poor nutrition as a puppy (not surprising). He painted a pretty grim picture, but we're not giving up hope. As long as the weather stays cool, we have time to explore options for Sawyer, but a dog living in Phoenix in the summer without the ability to pant? We can't even imagine it. 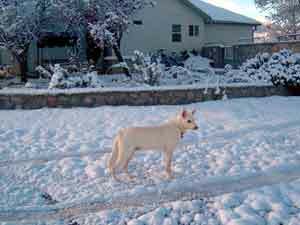 Our only alternative would be to find a home for Sawyer in a colder climate. UPDATE 1/10: We received a call from Dr. Vissar this afternoon, and the news is not encouraging. 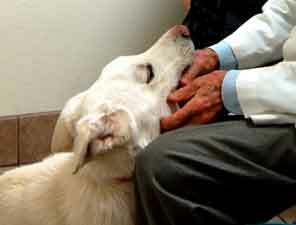 He has confirmed a diagnosis of Cranial Mandibular Osteopathy, with a poor prognosis. 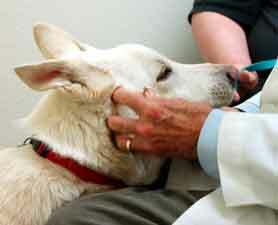 Dogs with this condition are usually not good candidates for surgery because, after surgery, the bone simply grows back. Dr. Vissar has a soft spot in his heart for Sawyer (everyone who meets him does) and has asked us to wait a few days until he receives additional reports from the radiologist and discusses this with his fellow doctors before making any decisions. UPDATE 1/13: We spoke with Dr. Vissar this morning, after he had had an opportunity to review the complete xrays, scans, etc. from Sawyer's visit last week. 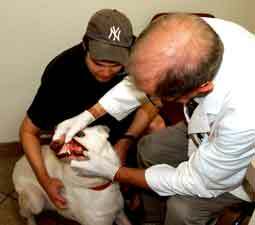 His opinion is that it is definitely a case of CMO (Cranial Mandibular Osteopathy) and that there is no surgical procedure that can alter or correct Sawyer's jaw limitations. The good news is that Sawyer is able to open his jaw enough to eat and drink, and that he is, otherwise, in excellent physical condition. It is Dr. V's expert opinion the disease probably won't progress any further than it already has -- in other words, "what you see is what you get" as far as Sawyer is concerned. Due to his CMO, it will not be possible for us to neuter Sawyer; however, we will check out other means of sterilization that don't require surgery and anesthesia. In the meantime, he is safe and happy with one of our staff members. We're sure there is a home for Sawyer out there somewhere. 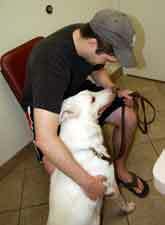 UPDATE 1/24: Sawyer's favorite vet, Dr. Vissar, called this morning to check up on him. It seems Sawyer has managed to wiggle his way into Dr. V's heart. Dr. Vissar has been talking about Sawyer to his colleagues in various parts of the country, and it was suggested that some anti-inflammatories be added to Sawyer's diet for the next month or two. Dr. V thought it might help Sawyer since this condition can be associated with some degree of pain (although Sawyer is showing no symptoms of being uncomfortable at all). We opted to go with Dr. V's suggestion (he is, after all, the expert) and will be putting Sawyer on an anti-inflammatory as soon as it arrives. 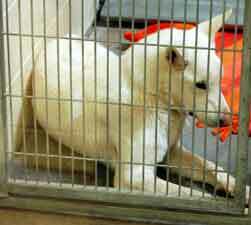 UPDATE 2/26: Sawyer is gaining weight and doing well. He simply loves life! He's a self-entertaining, easy keeper who wants nothing more than not to be called late to dinner. If you can provide Sawyer with a home in a cooler climate, even if it is just for the summer months, we would love to hear from you. The weather is already warming up, and it's only March. So far, Sawyer is able to tolerare the 70s and 80s without any trouble at all, but it's only going to get hotter. Anyone? 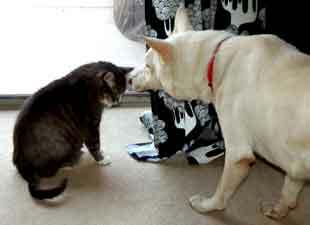 UPDATE 4/12: Sawyer has a foster home!! 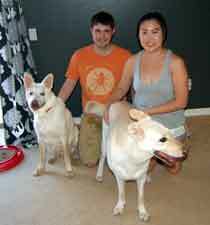 Thanks to long-time fosters, Deb and Jake for taking on their EIGHTH foster! And when it came time to choose their newest foster dog, it was Sawyer they chose!! We're still searching for a home in a cooler climate for Sawyer, but for now, he's a happy camper in his new foster digs! FOSTER UPDATE 6/21: "Sawyer (or as we call him, Booger) has settled into the home well. He is a sweet, happy guy who has a zest for life. He adores his food, adores his people, and adores playing. 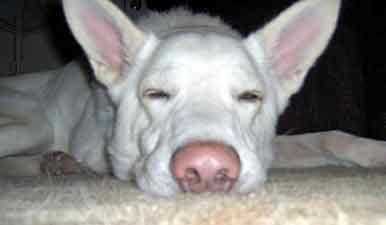 He is great with the cats - perhaps a bit nosey, but has somehow managed to avoid being bopped on the nose even once. I think they sense that he is special and can't truly hurt them, and so they go easy on him. There are a couple of things that I would say a future adopter needs to know, though. He unfortunately cannot be bathed - he is just too afraid of water and it does not do good things for him to have the people caring for him do that. So we have taken to buying deodorizing wipes from Petsmart, and an odor neutralizing spray. 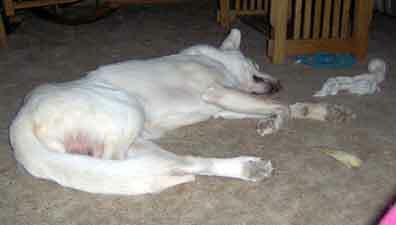 He gets wiped down on his face and legs every day after each meal and tolerates it as long as we do not startle him. It seems to be working well enough. I will look into getting a waterless shampoo - I think he'll be okay with that as well. I would also say that anybody interested would need to remember to go a bit slow with him. As you know, if he is startled he will wee himself. Not much, just a bit when he startles. A light easy touch at the right times is necessary. Not to say that he is not housebroken. On the contrary, he is very well housetrained - if he has gone outside he is trustworthy, but if we scare him by bending over to pet him too quickly, or clean him at the wrong time, he does get scared and pees. We just clean up and move on - we don't correct him just because he already has some issues with fear as it is. Other than that, he is such a good boy. 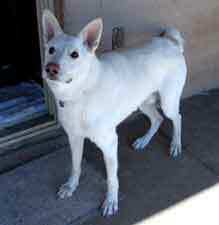 He is great with Miyu - has a really high play drive. We have to step in and make him rest, or he would play himself into the ground! She is rough, but he loves it, gets up and goes right at her all over again. The living room is a nice size for them to horse around, and I'm happy that they get to get some exercise outside of the heat with each other. His jaw doesn't stop him in the least from picking toys up, or ripping stuffies apart! He loves them and bounces with excitement. And he's beautifully crate trained as well - he really adores it. It's his own little special place. On days like this we just hang out downstairs, and when he's done horsing around with Miyu, he returns to it to get some rest. He's quiet as a mouse, only squeaks if he really has to go to the bathroom badly, or at the end of a long workday when we get home and he's excited to see us. He can be a bit rambunctious - I wouldn't recommend young children. He likes to jump on you in his excitement, something which we are trying to work with him on. Very smart - he knows to sit for his food, though we haven't really worked on much else with him. I really think that all he needs is the right person to meet him, and then they'll just fall in love. He is adorable, and he's so incredibly happy - it's hard to describe how sweet and happy of a boy he really is!" 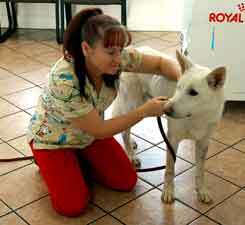 UPDATE 6/23: Sawyer saw Dr. Vissar at Arizona Veterinary Dental Specialists for a checkup. 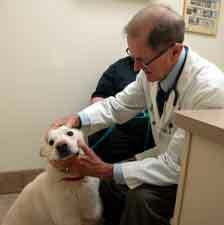 Dr. V was pleasantly surprised to see one of his favorite patients. After an examination, he actually thought that Sawyer's condition was better! Dr. V added an oral rinse to Sawyer's daily "beauty routine" and continued the oral antibiotics and generic rimadyl for any pain or inflammation. I'm fine, really. Can we please go home? All-in-all, Dr. V was very pleased with Sawyer's condition, not to mention an ELEVEN AND A HALF POUND WEIGHT GAIN since January! Dr. V is going to check with his anesthesiologist about the possibility of having Sawyer's teeth cleaned. We should be hearing back from him by the end of the week. 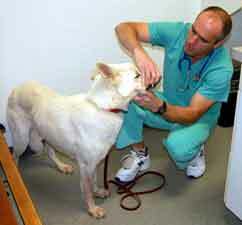 UPDATE 7/22: Sawyer saw Dr. Vissar at Arizona Veterinary Dental Specialists for a pre-dental checkup. Dr. Vissar's anesthesiologist agreed to do the procedure and has, in fact, done similar procedures before. We were delighted that Sawyer would FINALLY have a clean mouth. What we weren't NOT expecting was the price tag -- TWO THOUSAND DOLLARS!!! With $2,300 in our bank account, this is a huge hit. 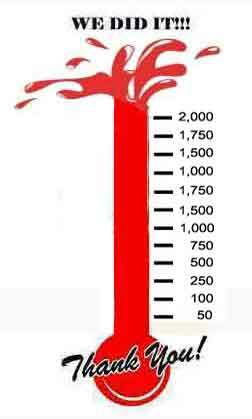 We need to raise the money, and we need to raise it FAST! Sawyer came out to Boot Camp today (10-26-2014) to show off his new cooling vest ~ Thank you to Dave & Mickey! 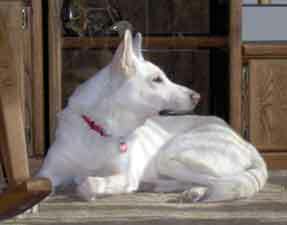 Note on the check "For the benefit of White GSD Rescue (Sawyer)"
UPDATE 11/18: Sawyer was moved to a new foster home today, with the possibility (if all goes well) of a permanent home. Our thanks go out to Michael, who was willing to give Sawyer a chance at forever, and to foster parents Deb & Jake, who have cared for Sawyer and kept him safe since April. We can't thank them enough. We will still be supporting Sawyer by providing his food, meds and supplements, so your donations are continuing to help Sawyer. FOSTER UPDATE 11/18: Things started off a little rocky for Sawyer and Michael when they arrived in Globe -- Sawyer REFUSED to get out of his crate, and no cajoling on Michael's part would convince him otherwise. Michael allowed Sawyer to chill out in his crate in the back of his vehicle for a bit and then decided enough was enough. According to Michael, "Well, I went out to the truck and told him that I'd had enough of this silliness. When I got the end of the leash in my hand he was a different dog! He came bolting out of the crate and was crazy ready for a walk! 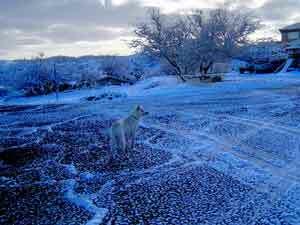 I took him up the road and when he came across some old javalena poop he went crazy sniffing around in every direction! We went for a long walk around the property and then into the house (he doesn't like the bare floors). He has demanded constant affection since! Oh, he doesn't like the inside stairs either, but eventually came UP them after I took him outside and around the end of the house. He is now finishing his dinner and getting a big drink of water." A wonderful ending to their first day together!! FOSTER UPDATE 11/19: "Sawyer is settling in very well. 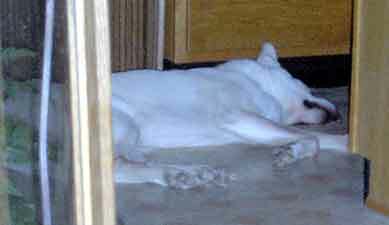 He has chosen to sleep in the carpeted space by the opening to the kitchen. I think he slept the whole night through. He still won't go down the inside stairs unless I have him on a leash. I have his crate down there, but he seems disinterested in it. I discovered this morning he is a total freak for breakfast sausage. I guess most dogs are. He was under my feet while I was cooking it, and ate what he was offered with gusto. If I go outside (and leave him inside) he demands a lot of lovin' when I come back in. And after walks too. I tried to brush him this morning and he didn't like it. I'll try a different brush next time. Today he went with me on my errands, bank, post office, grocery store; he waited patiently in the vehicle. Then I stopped to visit a friend at his business in downtown Globe. After my introductions and a visit, we went for a walk through downtown and I introduced him to three more of my friends. He was very polite. Kids going by on skateboards were not a problem either. We got home and he napped, then woke up and rolled around on the floor, even up on his back! Then he asked for another walk and made a bee-line for the vehicle!" 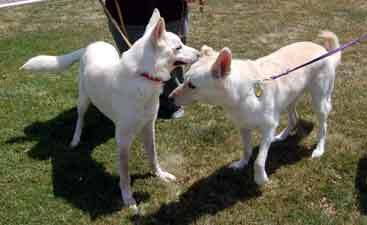 Sawyer has a new friend, Chewy, a friendly GSD mix! FOSTER UPDATE 11/22: "A lot of his little behaviors are fading away now. He doesn't cower when I reach for his collar (even when I don't have the leash) he lets me touch his feet and legs, he doesn't guard his food any more, and I can brush him everywhere with a soft-bristle brush. When he wants to go for a walk (or a ride) he will point me to his leash. Wednesday night he came down the stairs wanting affection and a walk at midnight. I put him in his crate when we got back. Thursday night he went right in his crate at 10:00 and was quiet through the night. Last night he cried and wanted out. Tonight, maybe no crate." 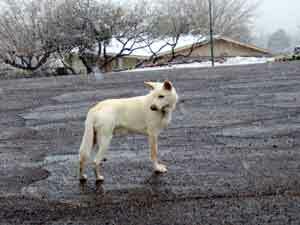 FOSTER UPDATE 11/23: "I have been wondering how Sawyer will react when our local pack of coyotes howled. Last night at 10:00 they started. First he barked, then he got excited running from room to room trying to find someplace to look for them, then he got scared, practically up in my lap. Sawyer has a prey drive! We came across a rabbit this morning and Sawyer wanted nothing more that to chase it down the street as it fled. Then he searched and sniffed out under all the bushes the rabbit was hiding under. Quail don't seem to be a problem; he sees them and shows interest in their movements, but gives no chase." 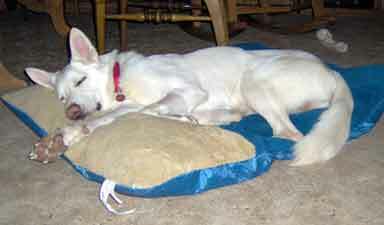 FOSTER UPDATE 11/25: "I managed to wear Sawyer out Monday! It was comical watching him fight sleep Monday evening. We went to Safford for a business meeting. He rode in the vehicle perfectly, and waited patiently while I made a couple of stops along the way. We also stopped and visited my uncle in Ft. Thomas. He was the perfect gentleman in my uncle's house, he explored some then sat on the floor by the couch I was sitting on. What a good boy! At lunch we walked main street in Safford and I sat on a bench outside the restaurant I was meeting some friends for lunch. Lots of people walked by, some spoke to him, some touched his head and ears. He loved it! What a "people person" lol. He waited patiently in the vehicle while we ate. 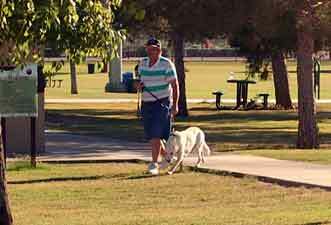 Then we went to the park for a walk, a stretch, a pit stop and a drink of water before heading home. He is an awesome traveling companion!" 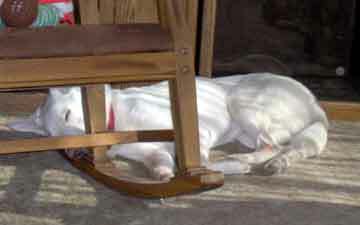 FOSTER UPDATE 11/27: "Sawyer had a wonderful Thanksgiving at Chewy's house. 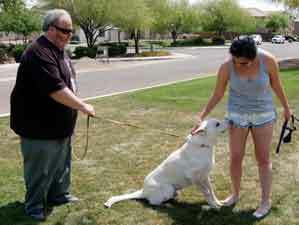 Chewy hosted three families, a total of 8 kids, 9 adults and four big dogs including Sawyer. 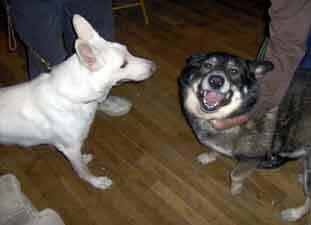 He wasn't too happy with one family's big intact male black lab, Shadow. Sawyer made that clear from the start. Shadow couldn't have cared less and just avoided him. Sawyer adored being the center of attention in the living room after dinner. He loved going from one person to the next for some lovein'. He was especially fond of a 14 year old boy with autism, and the boy adored Sawyer! His parent were amazed because he never gave their dog (Shadow) any attention at all. 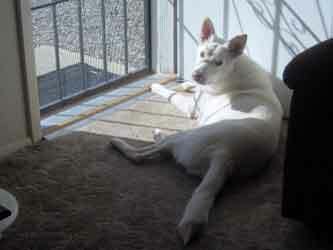 I forgot to mention that Sawyer now runs the stairs inside the house at will, both up and down, even in the dark!" Sawyer's new favorite "cool" spot in the house, the kitchen floor! Especially after walks or heavy play. FOSTER UPDATE 12/5: "Sawyer had a very busy, fun day today! He went Christmas Shopping and we were gone all day! 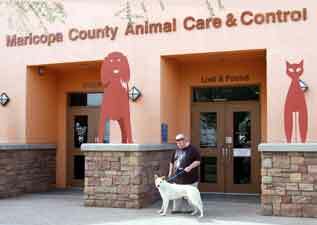 We started at Petco in Tempe, where we got Sawyer's Christmas present. Then we had lunch with friends on the patio at Rubios where he laid quietly beside our table and everyone passing just adored him. Then on to Home Depot where he did very well on a leash with me pushing a cart. The cart didn't bother him at all, and I think he liked it because he could take cues for my turns from it. Then a little walk outside and some water. After a couple of stops where Sawyer had to wait patiently in the vehicle, we headed back to Globe. Sawyer was worn out when we got home!" Sawyer loves his Christmas present - a feeding table! 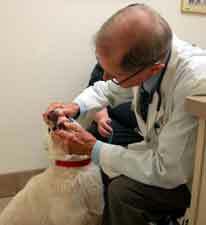 FOSTER UPDATE 12/12: "Sawyer saw my vet, Dr. Eubanks, this afternoon. 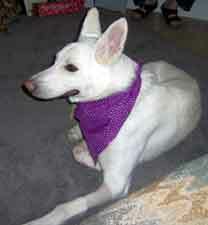 He is scheduled for neuter surgery December 17th 8:00 a.m. He is going to do it the "old school" way, with a knock-out shot. He will also administer a drug to dry up his saliva and do the surgery on a 20 degree incline table (head down). It takes longer for animals to recover from this anesthesia and Sawyer may or may not be ready to go home in the afternoon. Sawyer also got updated on all his vaccinations today and I will get a Gila County license for him after the neuter surgery. I asked the front desk if they could send you a copy of the neuter certificate. I suspect that if I send it, you'll get it quicker. Dr. Eubanks said that the red stains on his forelimbs are from his saliva. It reacts with sunlight and turns rust red. 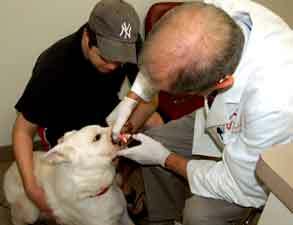 I need to watch him and make sure he is getting saliva on him as a result of eating or chewing, and not from licking." UPDATE 12/17: Sawyer had his neuter surgery today and came through with flying colors. He is resting comfortably in the home of his foster dad, Michael. He is now officially available for adoption. FOSTER UPDATE 12/17: "He has managed to worm his way into my heart, I don't think I could give him up to anyone. Unless you ask me at 4:00-4:30 in the morning, lol. I need to find a way to return his crate to you as well, he hasn't used it in several days and I put it outside on the back porch last Saturday. It has been truly amazing to see him become a happy, confident dog, compared to the shy, scared dog I picked up. I've discovered he is still really sensitive to a harsh or shaming tone of voice, though. I forgot to tell you I received a box of Embark a couple of days after I inquired (I ran out the morning of the day before it came). Dr. Eubanks agrees that he is a little thin, but cautions that he should stay that way because of the heat, and does not recommend an increase in weight. Feeding him the amounts that Jake & Deb recommended, he was leaving a lot to waste. I tried adding a half can of Alpo to stimulate him to eat, which worked for a few days, but he has been eating less again, so I have been reducing the amount of the Embark by about 20%, and still feeding the half-can of Alpo. I say let the next box come and I'll have a better idea how long a box will last." Sawyer was determined to stay awake for Santa ... but didn't quite make it. Maybe next year. We also didn't find Sawyer an adoptive home for Christmas, but we're hopeful for the new year that he will find forever. He is now neutered, up-to-date on vaccinations and ready to steal your heart. 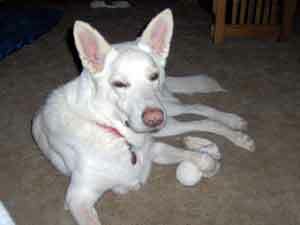 FOSTER UPDATE 12/26: "Sawyer is healing well, I have no reason for concern. He found his appetite and energy a few days ago I cant feed him enough right now. One of my neighbor's daughter was walking by the other day and he ran out and played with her, running in big circles and playing "tag" with her. Now when we go for walks he heads in the direction of their house!" Nothing like a comfy new bed! The forecast is for snow ... and Sawyer is ready! FOSTER UPDATE 1/1/15: "We got about three inches last night. Sawyer didn't think much one way or another after a the first few pensive steps. Sawyer came down the stairs and jumped in the bed with me exactly at midnight. I think someone in the neighborhood set off fireworks." UPDATE 01/25/15 FROM MICHAEL: "Sawyer had lots of fun today! 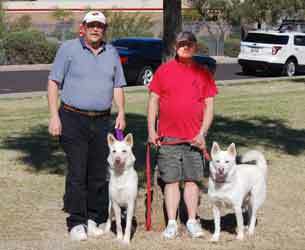 We went to see a friend in Scottsdale, Bob. 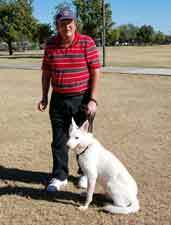 Bob has a White German Shepherd mix service dog named Biscuit. I have been working on Sawyer's concentration and obedience, so Bob suggested we go to the dog park on Hayden and McDonald. But first, a stop for lunch at a nice restaurant with a patio where Sawyer and Biscuit relaxed while we ate. They both were a hit with the employees and guests. 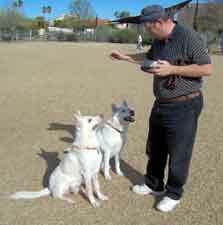 When we arrived at the dog park we gave them both time to run and play and burn off some energy. 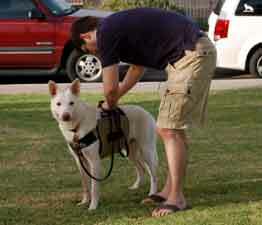 Then we had a short session to work on "Sit - Stay - Down". Sawyer needs to work on "Stay". 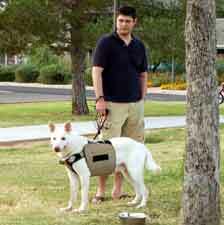 Biscuit, as a service dog, is highly trained so he participated to guide Sawyer. Treats were involved so I had their undivided attention. A few other strange dogs at the park were begging for treats too. They proved to be no distraction. Good boy! After the park we went to an outdoor art show. I think Sawyer got more attention than the art on display. Dinner was at a pizza pub downtown with 25 friends. 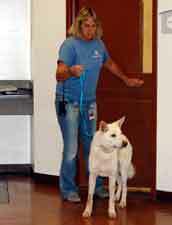 Sawyer and Biscuit were in heaven making the rounds and getting attention from all those people!" 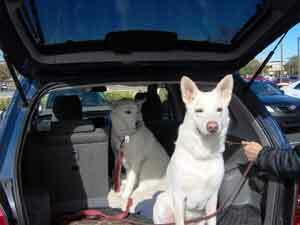 Sawyer and Biscuit - Going to the dog park! Sawyer and Biscuit at the dog park! Working on "Sit - Stay - Down"
Sawyer chilling on the restaurant patio! UPDATE 1/26/15 FROM MICHAEL: "I have been teaching Sawyer to fetch a ball-in-a-sock toy. At first he had no idea what to do when I tossed it, but eventually the light came on and he ran after it and brought it back. But true to German Shepherd nature he resists giving the toy back. After three or four rounds he will lay down with it and chew on it for a while. A few days ago he surprised me by tearing the sock off the ball, then playing with the ball! I had no idea he knew how to have fun with a ball and he played with it for about an hour, pushing it around with his nose. Of course, I had to get up a few times to get it out from under furniture. He has me trained so well! lol." UPDATE 2/13/15 FROM MICHAEL: "He is a VERY happy boy! He spends every waking moment with me, gets to go for lots of walks, runs and rides and gets all the love'n he wants when he asks (even at 4:00 in the morning). He sleeps at my feet and I practically have to kick him out of the way of my recliner!" UPDATE 3/6/15 FROM MICHAEL: "Time for a road trip! 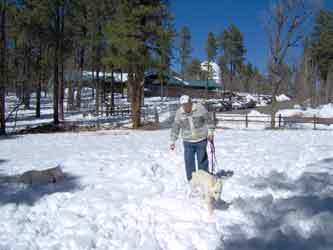 I took Sawyer and his buddy Biscuit and my friend Bob up to Flagstaff to play in the snow. 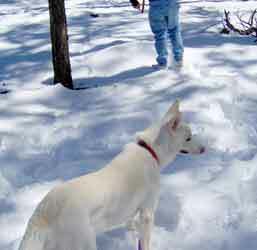 Sawyer was a little reluctant at first, but Biscuit, being part Husky, was in his environment and quickly coaxed Sawyer out into the snow for lots of romping and wrestling. They played hard for about two hours while Bob and I looked on." Michael and Sawyer (at left) surprised us at Boot Camp today! 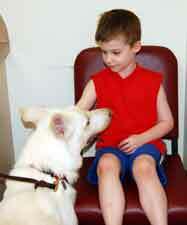 IT IS OFFICIAL ~ SAWYER HAS BEEN ADOPTED BY MICHAEL!! !